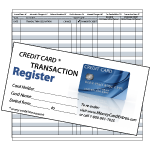 Place this credit card register into any standard checkbook cover. It's the same size and appearance as most standard check registers. 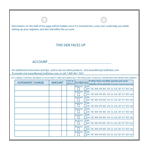 Each page provides columns to update both the Debt balance and the amount of Available Credit. Never be in the dark again not knowing how much you currently owe, or worse, not knowing how much available credit you have at any given moment (like when it's time to pay the restaurant bill!). Capacity: 19 full pages provide 247 double-line transactions, or 494 single-line transactions per register. Usage Tip: You can share the same checkbook cover as your current checkbook and its register (convenient, since these covers often have slots for credit cards and debit cards as well). 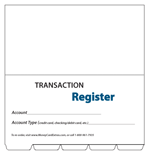 Simply insert the top booklet cover of the credit card register into the same section as the check register's top booklet cover, preferably on top of it. 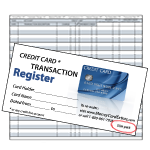 This would place the credit card register on top of the check register (thus keeping the check register closest to the checkbook and the credit card register closest to the credit cards). 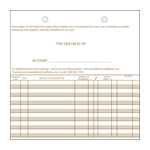 To visually distinguish one register from the other, add our tab dividers (AC-101) to your shopping cart. Simply place one of these dividers on top of the credit card register and another between the two registers before inserting all into the checkbook cover. Multiple Credit Card Users: There is no need to limit yourself to just one credit card register for your checkbook cover. 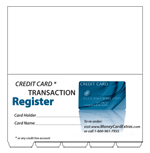 You can fit three or four of these standard size credit card registers into a single checkbook cover in addition to the check register! This means you could keep track of three or four credit cards all in the same checkbook cover (using the standard size credit card registers). 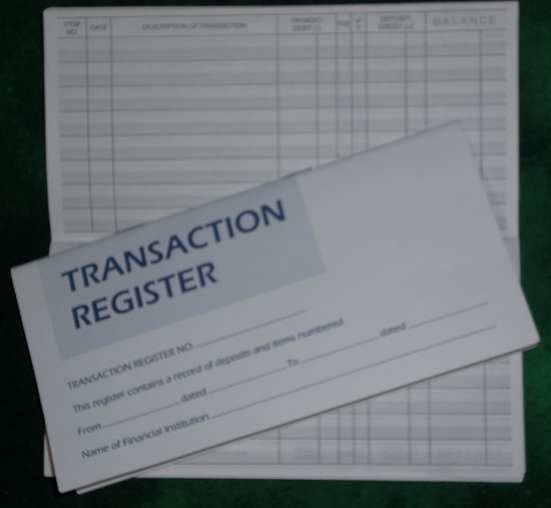 To visually distinguish one register from the other, just insert our tab dividers (AC-101) between the registers. 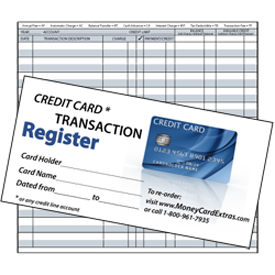 If you have more than four credit cards (up to six) we recommend our Slim registers (CR-102), which will allow five to six credit card registers to fit in a single checkbook cover (because there are fewer pages per register) in addition to the check register, and if you have more than six credit cards, you can track up to ten, twelve, even fourteen accounts (including checking/debit accounts) with our loose-leaf registers (CR-103 and DR-101), because you can choose to use just a few sheets per each account (this time using our AC-102 tabs to separate the sections). Our emphasis has been on having your credit card registers being as portable as your checkbook and its register by making it possible to use a single checkbook cover to contain all of your registers, both for credit card and checking/debit card accounts. This also provides the added benefit of having all your accounts in one compact container. If these benefits are not that important for your circumstances, you can simply use a separate standard credit card register for each of your credit cards, regardless of how many you have, any simply keep them all neatly stored in an easily accessible file box, drawer or file cabinet in your home or office.